Reconstructing Grimm's Holmes: Precise. Concise. Witty. Dramatic narrative photo outfit Reconstructing Grimm launches its first live theater production this month as it presents a new tale of the legendary detective Sherlock Holmes. Written, directed and the costumed by Liz Shipe, the show is a brilliantly concise and thoroughly entertaining hour of mystery theater. 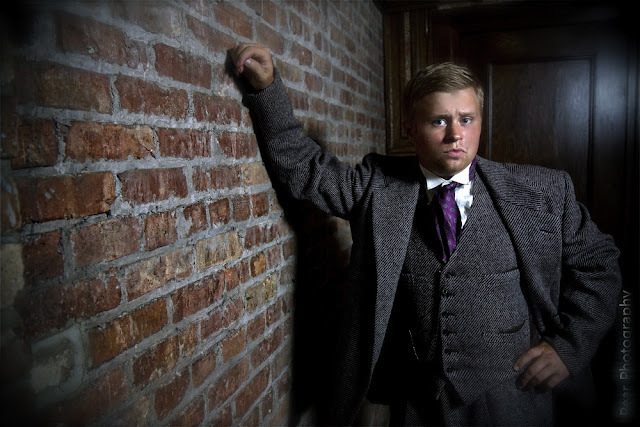 Michael Traynor stars as a young, lean Sherlock Holmes. Traynor is capable of dazzlingly precise stage presence which he wields here to impressive effect. The character as present in Shipe's script comes across as a somewhat cold and arrogant man who would rather not be bothered with people. There is complexity to the character beyond that, but a good portion of the reason why this character is as appealing as he is lies in Traynor's ability to make a character Shipe's Holmes come across as irrepressibly charming. As a playwright Shipe clearly knows that she's working with and helped him to craft someone who is both true to the spirit of the original character AND novel enough to seem fresh and interesting after many, many decades of dramatic interpretations. A good portion of Shipe's cleverness as a playwright lies in a very clever grasp of exactly how much she pack into a production that is set to take place entirely in two locations in the beautifully authentic period space of the early 20th century mansion in which it's being staged. it allows her to be surgically precise with a script that plays out in a little over one hour without intermission. Much like Traynor's Holmes, Shipe's story is lithe, quick-witted and a lot of fun to watch. There's a lot of humor in here.On some level this could almost be seen as a mystery comedy with the amount of humor that's in the script. The ensemble puts together an enough intensity to keep the comedy from overpowering the mystery, which keeps the whole ting remarkably well-balanced. Max Hultquist plays Doctor Watson--the heart and humanity that helps keep Holmes' coldness from seeming entirely too distant. Hultquist plays a man that is neither brash nor dimwitted, which suits the role quite well. Whereas Holmes is charming fro his lack of humanity, Hultquist's Watson is charming for his tempered gentlemanly compassion. Bryan Quinn plays Inspector Lestrade--a perfectly capable individual who reluctantly comes to Holmes for his expertise on a murder. Quinn makes the role memorable with a congenial sense of animosity towards Holmes. He clearly respects Holmes, but would clearly rather not have to employ his help. Quinn brings this to the performance with clever subtlety in places. Gladys Rhodes Chmiel and Tom Marks play gradious hosts in the roles of Mrs. Hudson and Charles Hilton. They welcome the audiences as members of the Baker Street Irregulars who have been invited into Holmes' home to thank them for their service. It's a fun premise that draws the atmosphere of the Brumder into the production beautifully with the welcome accompaniment of drinks, coffee and light snacks before the show. Amanda J. Hull and playwrights/director/actress Elizabeth Shipe round out the cast as a couple of persons of interest in the murder. They both put in suitably entertaining performances that add the right weight to things. to go on about either one of them at greater length would compromise the integrity of the mystery. Suffice it to say, this is a really enjoyable show all around. This is a really, really impressive first outing for Shipe and Reconstructing Grimm. Reconstructing Grimm's production of Sherlock Holmes and a Most Irregular Tea Party continues through October 14 at the Brumder Mansion. A few tickets are still available as of this posting. For ticket reservations call 414 -388-9104. Or visit the Brumder Mansion online. It sounds great!!! Wish I could see it. It is scheduled to come back next March! It is one of our most successful efforts - great cast, and our publicity issues have finally been worked out. sold out almost all of our shows.